Christian Townsend, Harris Brogan, Lewis Watt and Jamie Damerell. The glorious summer weather unfortunately decided to give a wide berth to the 2018 Borders Confined Junior Tennis Tournament. Playing conditions at the Borders Tennis Centre were often ‘challenging’. To the raft of participants, however, these were just minor obstacles to overcome in the quest to acquire silverware this year. Central Borders Tennis Clubs again performed strongly throughout the event, particularly Earlston LTC. There were titles for Alisa Clark, Ellen Crawford and Olivia Richards (all Earlston LTC), Lewis Watt (Borders Tennis Centre), Alexander Hart (St Boswells TC) and Martin Goldie (Selkirk LTC). 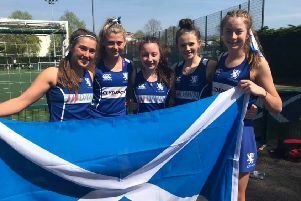 Jamie Damerell, Ross Christie, Freya Robertson (all Earlston LTC) and Alice Macbrayne (Melrose Waverley TC) also deserved special mention, while Gregor Welsh (Kelso) was a credit to the eastern Borders clubs. Once again, however, the highlight of the week was undoubtedly the performances from Wilton Park LTCs’ Harris Brogan, who matched his 2017 achievement of competing in five finals. Despite taking the 16u and 18u singles, 16u doubles and 18u mixed doubles titles, Harris’ attempted clean sweep was thwarted by Lewis Watt (Borders Tennis Centre) and Gregor Welsh (Kelso) in the 18u doubles. Also notable was the performances of Ailsa Clark from Earlston LTC. Ailsa, fresh from reaching the South of Scotland singles final earlier in the summer, reached three finals. She won the 12u singles title as well as the 18u doubles and finished runner-up to her fellow Earlstonian, Ellen Crawford, in the 18u singles. Other multiple titles went to Indie Lucas (Duns LTC, 18u doubles and mixed doubles), Adam Clunie (West Linton TC, 12u singles and 14u doubles) and Rory Mackenzie (Innerleithen LTC, 8u and 9u singles). The organisers have expressed thanks to everyone for their participation this year, with special mention given to the continuing improvement in the standard of play. “We look forward to seeing this trend continue in future years’ events,” said a spokesman.